Ticket controlled dispersed queue management systems allow the correct member of staff to be matched to your customer’s requirements. Customers feel that they are being served as soon as they enter your environment, with a positive experience of ‘first come first served’ and the added benefit of being able to browse while they wait, thus increasing revenue in a retail environment. Ticket controlled electronic Queuing for dispersed queues allow you to match resources to demand and improve operational efficiencies. eTurn : a basic, simple-to-use ticketing solution, calling customers forward to a single line operation with up to 15 counters. 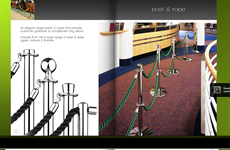 eGestat : an innovative user friendly and adaptable queue management system. With the ability to operate up to 8 services and 24 counters, eGestat offers great value for money. eSirius : a web based queue management solution, with unlimited services, counters, multi-site operation and digital media capabilities. eSirius enables full appointment and schedule management, allowing customers to book appointments onsite or in advance over the internet, receiving identification codes by email or SMS. With eSirius the possibilities are endless! eTrack : a web based solution specially designed for managing goods collection with the capability to incorporate digital media to add in queue entertainment.